A data manager can expose operations that are not part of the CMDBf specification by providing a custom capability and implementation. The org.eclipse.cosmos.dc.sandbox.example. * bundles provide an example on how to create a data manager with custom APIs. # API bundle: (e.g. org.eclipse.cosmos.dc.sandbox.example.common)  This "common" bundle is used by both the server and the client. # Implementation bundle: Server code that provides implementation of the custom capability. # Client proxy: remote API for the data manager. * The interface declaration is decorated by the following annotation. Namespace is declared as a public constant in the interface class. * Methods are decorated by the @ManagedOperation annotation. * The URI and QName of each operation and their parameters are also declared in the interface. The steps for creating the implemtation bundle is same as those used to create a basic MDR as described in the prvious section. 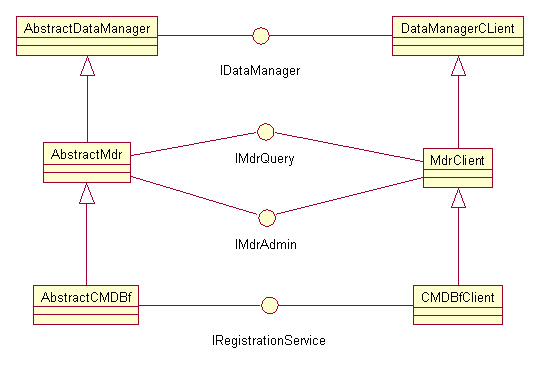 The difference is that the data manager implementation class will also implement the custom capability API in the class delaration, and provide the implementation in the class. Subclass from MDRClient or DataManagerClient when you need to provide a client proxy of a data managner that provides custom capabilities.